When you work in messy environments where splashes and spillages are a frequent sight, you need gloves that protect your hands as well as your forearms. The Uvex Rubiflex NB27 27cm Nitrile Coated Safety Gauntlets are designed with a full coating of nitrile rubber than protects your arms against water, oil and dirt, making them ideal for a range of industries. 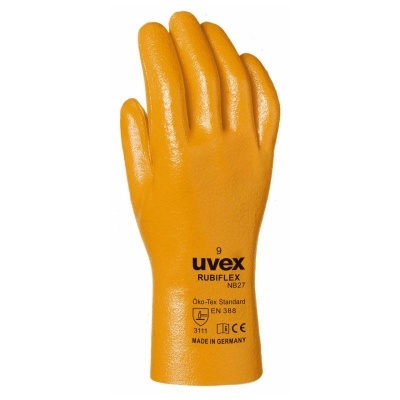 The Uvex Rubiflex NB27 Safety Gauntlets are available in four sizes that should suit the hands of most users. Please measure the circumference of your hand around the knuckles (excluding the thumb) with your hand open and your fingers together, and the length of your hand from the tip of your middle finger to your wrist.